One of the meals I missed the most when I moved out to live on my own was my mom’s lentil soup. 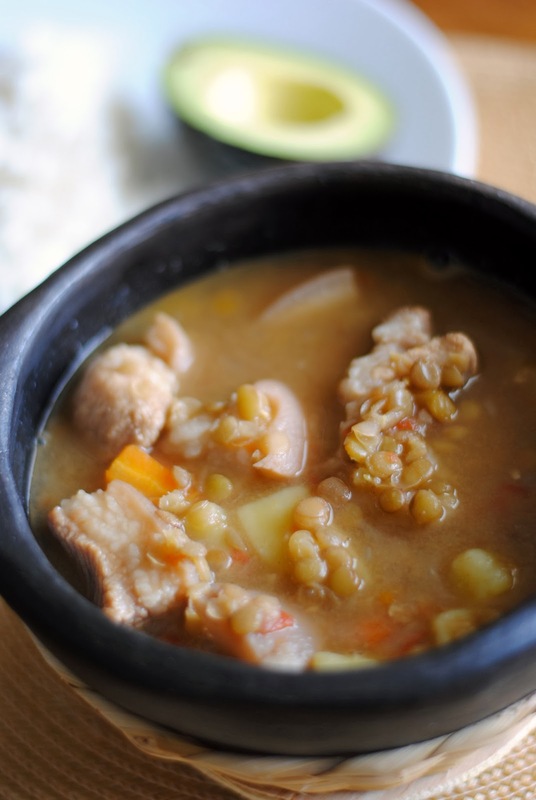 She doesn’t do anything special with it and it’s actually more of a stew than a soup but it is loaded with Colombian flavor. One day I missed it so much that I went to the store right after work to get me a bag of lentils, cooked them as per the bag’s basic directions and ate them all. It didn’t matter that they came out dry and bland, I was just so happy that I was eating lentils for a change. Since then, I have changed that basic recipe a bit. I’ve added tomatoes, veggies and my all time favorite, pork belly. There’s something about the combination of any kind of pork meat and lentils that just works great for me. 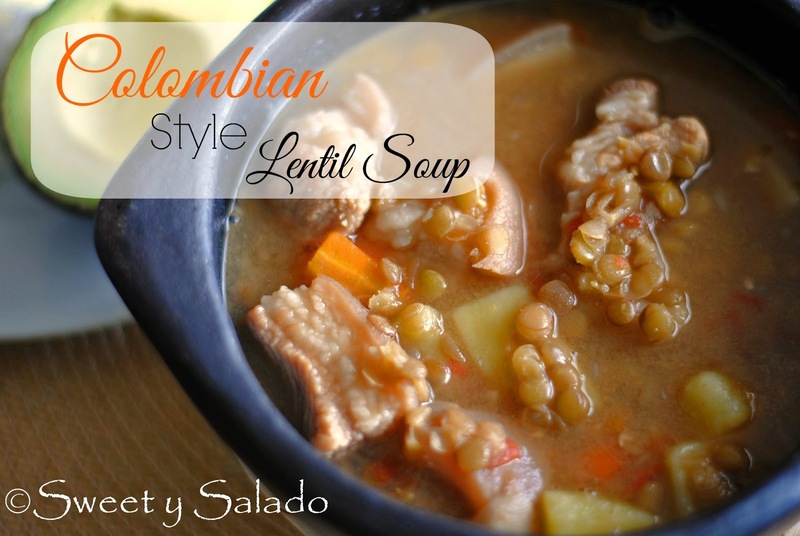 Lentil soup is also one of the most popular meals served in Colombia on New Year’s Eve to celebrate the New Year. It’s a symbol of good fortune, wealth and health and many Colombian homes will have a big pot on the stove to celebrate. If you didn’t know, most Colombians are very superstitious and they will do crazy things on New Year’s Eve for good luck such as eating this lentil soup, eating 12 grapes at the stroke of midnight and making a wish for each one, running around the block with a suitcase in hand so you can travel all year round during the New Year, wearing yellow underwear for good luck, wearing red underwear to find true love, the list goes on and on. So, if you want to have a fantastic New Year’s Eve to remember, make sure you spend it with a big group of crazy Colombians, it is a blast! For this recipe, I had the pleasure of collaborating with a fantastic YouTube channel called Eat East Indian where you will find all kinds of amazing Indian recipes. In her collaboration, Aditi, is making lentils curry in a crockpot which is not only delicious but very convenient! I have attached her video so you can see how easy it is to prepare and don’t forget to visit her channel to check out more delicious recipes. 1. Heat oil in a large pot over medium low heat. Add the garlic and onion and cook for about 5 minutes. Then, add the chopped tomatoes and cook for another 5 minutes or until they’re soft. 2. Add water, cover and bring to a boil. Then, add the beef bouillon, lentils, carrots, potatoes, pork belly, cumin, salt and pepper. You can add more water if you wish. Cover, bring to a boil over high heat and then cook at medium low heat for 35-40 minutes or until the lentils are tender. Once the lentils are done, taste for seasoning and add more salt and pepper if needed before serving. 4. Serve immediately with some chopped cilantro and with a side of white rice and avocado. Hi Simon, I'm also a big fan of lentils. If people only knew how good they taste and how good they are for you, they would eat them more often. Thanks for stopping by!